New Haven presents The Goodmans – Live in Texas CD! 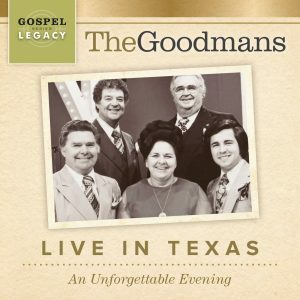 Legendary gospel music family The Goodmans are sharing a rare night of their biggest hits with fans on Live In Texas, An Unforgettable Evening available at retail now via New Haven Records. The new project, the 12th installment in the popular Gospel Legacy Series, features a performance recorded straight to tape during the group’s 1974 concert in Arlington, Texas. The album serves as a companion piece to 2007’s bestselling DVD, which captured live footage of the same event. The group’s renowned showmanship is palpable throughout the recording’s 18 tracks, which highlight The Goodmans’ signature harmonies and unmatched enthusiasm. With 7 million career units sold, The Goodmans are one of Southern Gospel’s bestselling groups, and Live In Texas features many of their most revered hits, including “What Heaven Means To Me,” “Lighthouse,” “He’s Coming Again” and “The Eastern Gate,” among others. In between performances, members Howard, Rusty and Sam share stories behind select songs. “The Goodmans are one of Southern Gospel’s most endearing families, and their Live In Texas DVD project continues to be one of the most special additions to their discography. We are thrilled to now be able to offer this never-before-released version of the audio recording from that same incredible night,” shares New Haven Records president Ken Harding. “We hope this CD will be a treasured keepsake for fans for years to come.” The album’s first single, “Looking For A City,” is currently vying for adds at Southern Gospel radio and features the beautiful vocals of Vestal Goodman and Johnny Cook. The song and the rest of the set list from Live In Texas are already resonating with radio programmers across the country. Live In Texas, An Unforgettable Evening is available at Family Christian, Lifeway, iTunes, Amazon and wherever Christian music is sold. For more information, visit www.newhavenrecords.com.